In a large bowl, combine the oats, almonds, coconut, sugar, and salt. Stir well to blend. In a small saucepan, warm the honey and oil over low heat, whisking occasionally – watch out! the oil will want to splash - until the honey is loose. Pour over the dry ingredients, and stir to combine well. Spread the mixture evenly on a rimmed baking sheet. Bake for about 20 minutes, or until golden. 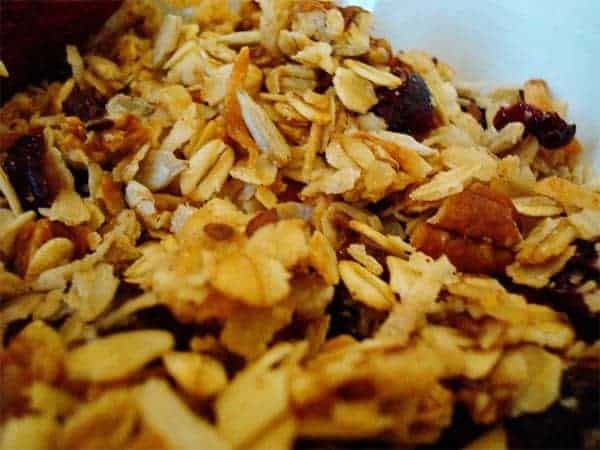 Set a timer to go off halfway through the baking time, so that you can give the granola a good stir; this helps it to cook evenly. When it’s ready, remove the pan from the oven, stir well – this will keep it from cooling into a hard, solid sheet – and cool completely. When cool, transfer the granola to a large bowl, storage jar, or zipper-lock plastic bag. Add the chocolate, and stir (or shake, if using a jar or bag) to mix. Glad you like it, Shalece! It’s such an old recipe, but it’s a favorite of mine, too! Ohmygoodness. This is SO SO GOOD!!!!!! I doubled the recipe and ended up baking 35 minutes total because it was thicker on the pan. I used Trader Joe’s coconut chips and they really put it over the top like whoa. I also used chocolate chips because that’s what I had on hand. Perfection! 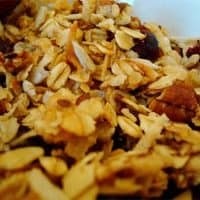 Huge fan of your cashew and coconut granola – I believe I have made it about 6 times in the last month! Thinking of trying this today, but curious why the bake time is so short compared to your cashew coconut granola? Just a different method based on the ingredients, I think, but it could probably be adapted to a similar bake temp/method to the other recipe, too. Hi Mel! I love your website! Any suggestions for a substitute for the coconut??? I’m not a coconut fan but I really want to try this recipe (and your other granola ones too!). I’ve subbed in rice crispies when I’ve made other granola bars before… What do you think? Thanks! This is so yummy! Successfully made with rice crispies instead of coconut! So easy and so good! I am glad the granola turned out with the cereal sub. I was going to suggest just adding a few more oats to compensate, but it sounds like your way worked! How would high quality chocolate chips be in this? Not much of a bittersweet chocolate fan, but always have choc chips around. I loved your cashew granola recipe and am trying this one next. Thanks for your wonderful recipes! Your website is one of the few whose recipes consistently turn out well! Sara – I think chocolate chips could work just fine as long as the flavor is good. I am glad you loved the Cashew Granola!